To the love-struck romantics and everyone who celebrate St Valentine's Day, have a wonderful and memorable evening with your loved ones. 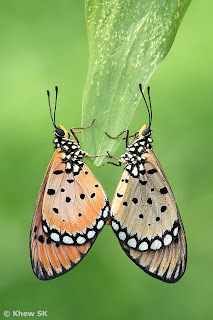 Here's a pair of Tawny Costers (Acraea violae) in flagrante delicto. The honey's sweet, and so are you. And Fortune said it shou'd be you. Quite discreet really and not as risque as the last post of the Common Mormon.